Below is the complete text of a press release available via the CMS website. 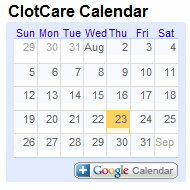 Visit clotcare.org/clotcare/dvtpeneverevents.aspx for a critical analysis of the benefits and potential problems caused by Medicare's decision. The Centers for Medicare & Medicaid Services (CMS) announced today it is taking several actions to improve the quality of care in hospitals and reduce the number of "never events" -- preventable medical errors that result in serious consequences for the patient. "Never events cause serious injury or death to beneficiaries and result in unnecessary costs to Medicare and Medicaid due to the need to treat the consequences of the errors," said CMS Acting Administrator Kerry Weems. "The steps taken today reflect our strong conviction that these events, in fact, should be prevented, and our commitment to protecting Medicare and Medicaid patients from them." A final acute care inpatient prospective payment (IPPS) rule that went on display today at the Office of the Federal Register for publication August 19, 2008 updates Medicare payments to hospitals for fiscal year (FY) 2009 and provides additional incentives for hospitals to improve the quality of care provided to people with Medicare. As part of these quality of care incentives, the rule includes payment provisions to reduce never events that occur in hospitals. In addition to the final rule, CMS today sent a letter to state Medicaid directors providing information about how states can adopt the same never events practices. The letter specifically encourages states to adopt the same non-payment policies outlined in today’s final Medicare rule. Nearly 20 states already have or are considering methods to eliminate payment for some never events. CMS also announced today the opening of a process to develop three National Coverage Determinations (NCDs) that would address Medicare coverage of certain surgical procedures. Medicare NCDs set national policy on whether Medicare will cover an item or service and under what conditions. In the absence of an NCD, coverage decisions are made by the local contractors that process and pay Medicare claims. The three types of surgery under consideration are surgery on the wrong body part, surgery on the wrong patient, and wrong surgery performed on a patient. Occurrences of the types of surgeries in the NCDs announced today have been identified by the National Quality Forum (NQF) as "Serious Reportable Events," commonly referred to as "never events." Evaluating coverage of these procedures is yet another important step for Medicare in addressing concerns regarding never events. CMS today begins the NCD process by commencing a national coverage analysis (NCA) with a 30-day public comment period. During the comment period CMS accepts comments from the public regarding the issues under consideration. A proposed decision memorandum will be released on or before February 1, 2009, for another round of public comments and then finalized no later than April 30, 2009. In 2002, prompted in part by the release of the 1999 Institute of Medicine report titled "To Err is Human: Building a Safer Health System," the NQF created a list of 27 Serious Reportable Events, which was expanded to 28 events in 2006. The NQF defines these events as errors in medical care that are clearly identifiable, preventable and serious in their consequences for patients. The IOM also concluded that medical errors including those that result in hospital-acquired conditions, may be responsible for as many as 98,000 deaths annually, at costs of up to $29 billion. In addition to the administrative actions being taken today, specific legislative proposals were included in the President’s FY 2009 budget submitted to Congress that would have prohibited Medicare payment for never events and would have required hospitals to report never events or receive a reduced annual payment update. The IPPS rule adds conditions, including one NQF never event, to the list of conditions that have been determined to be reasonably preventable through proper care. Beginning last year, as required by the Deficit Reduction Act of 2005 (DRA), CMS began selecting hospital-acquired conditions (HACs) that were determined to be reasonably preventable. If a condition is not present upon admission, but is subsequently acquired during the hospital stay, Medicare will no longer pay the additional cost of the hospitalization. The patient is not responsible for the additional cost. Rather, the hospital is being encouraged to prevent an adverse event and improve the reliability of care it is giving to Medicare patients. The final rule issued today also expands the Reporting Hospital Quality Data for Annual Payment Update Program. The Medicare law requires CMS to reduce payments to hospitals that do not successfully report quality measures adopted under the program by two percent from the percentage increase that would otherwise apply to their payment rates. The quality measures are publicly reported on the CMS Hospital Compare Web site, a tool that can be used by beneficiaries in choosing where to receive treatment. Hospitals are currently required to report 30 quality measures on their claims for Medicare inpatient services to qualify for a full update to their FY 2009 payment rates. CMS had discussed 43 new quality measures in the proposed rule and requested public comment on those measures. After reviewing public comments on the proposed rule, CMS decided to add only 13 measures. CMS is also finalizing its proposal to retire one pneumonia measure - oxygenation assessment - effective January 1, 2009. Therefore, the total number of measures for reporting in 2009 will be 42. The retirement of a measure reflects hospitals overall improvement of care for this condition and creates the opportunity for additional quality measures to be added, thus further enhancing the opportunity for Medicare to measure care and drive overall improvement. The IPPS, which was first implemented in 1983, was intended to reward hospitals for being efficient by making a single payment to the hospital based on the average costs of treating a patient with a particular diagnosis, rather than paying for the actual costs of each case. However, until the 2005 DRA, Medicare did not have the legal authority to use its payment system to encourage hospitals to improve the quality and reliability of care they furnish. "While it may be some time before we can begin to assess the real impact of these steps on patient care, we are hearing from hospitals around the country about efforts they have undertaken in the past year to improve staff training and other measures to reduce the incidence of these preventable conditions," Weems said. "And other payers, both public and private, are beginning to adopt similar policies in their payment systems. This is a win-win situation: better outcomes at less overall cost." The final IPPS rule announced today updates payment policies and rates for more than 3,500 hospitals that are paid under Medicare’s diagnosis related group (DRG) payment system and is designed to promote the Administration’s goal of transforming Medicare to a prudent purchaser of health care services, paying for quality of services, not just quantity. Overall, the final rule is estimated to increase Medicare payments to acute care hospitals by nearly $4.75 billion. The final rule will appear in the August 19, 2008 Federal Register, and will be effective for discharges on or after October 1, 2008. Additional details about open NCAs are available on the tracking sheets found on the coverage website at: http://www.cms.hhs.gov/center/coverage.asp. Instructions for submitting comments may be found at: https://www.cms.hhs.gov/InfoExchange/02_publiccomments.asp.